Peter Martin: Private banks are infuriating the RBA. Why it went big. Private banks are infuriating the RBA. Why it went big. Home and business borrowers are likely to get just two thirds of the 0.50 point interest rate cut delivered by the Reserve Bank yesterday after the Bank of Queensland went out ahead of its rivals and delivered only 0.35 points. The bank’s decision to cut its variable rate to 7.11 rather than 6.96 per cent will deny a customer with a $300,000 mortgage rate $28 per month. Age calculations suggest that if all of the banks withheld as much of the cut as the Bank of Queensland they would hang on to an extra $1.2 billion per year. RateCity chief executive Damian Smith said none of the big banks was likely to show its hand until the ANZ announced its decision at its scheduled rates review on Friday May 11. The new practice adopted by the big four this year of reviewing and adjusting thier rates independently of the Reserve is infuriating the Bank. The Age has learned that one of the reasons the Reserve Bank went for a big cut of 0.50 points yesterday rather than a more traditional 0.25 with the option of a followup was a concern that each time one of the big four adjusted its rates separately from the Reserve consumer and business and confidence took a hit. The Bank believes a ‘drip feed’ of negative news about small adjustments (such as the ANZ’s two recent increases of 0.06 per cent) is negating the effect on confidence of its bigger cuts in the overall level of rates. The big bank’s new practice of not immediately responding to the Reserve Bank left Treasurer Wayne Swan unable to shame banks for not passing on cuts as he has done in the past. During as break from budget preparations he told journalists in parliament house bank customers would be “very angry” if the cut was not passed on in full. 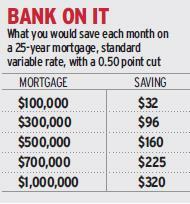 If fully passed on the 0.50 cut in the Reserve Bank cash rate will save a borrower with a $300,000 mortgage $96 per month. If only partly passed on as done by the Bank of Queensland it will save $68 per month. Private bank analysts believe that withholding 0.10 or 0.15 points of the 0.50 cut would complete the process of restoring bank margins to where they were in mid 2011 before wholesale borrowing costs ballooned. Contributing the Bank’s decision to cut rates 0.50 points rather than 0.25 as it had been considering a month ago was a feeling economic indicators have weakened. It believes the inflation figures released ahead of ANZAC day show evidence of deep discounting by retailers desperate to move stock. The Bank made its decision taking into account what it knows about next week’s budget, meaning it does not necessarily expect to cut rates further in response to it. Futures traders were last night pricing in cuts totalling a further 0.50 points in the next three months.